Please visit https://www.getselfhelp.co.uk//problems.htm for more information. Health Matters has a wealth of information on many conditions.Please visit the site or click on the links below for more information. 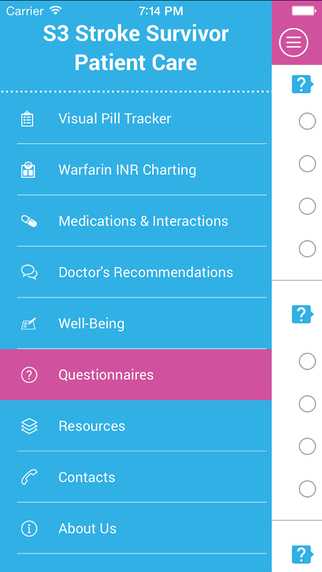 This is an application developed for S3 (Stroke Support Station) by Dr. Melvyn WB Zhang, Dr. Roger CM Ho & Dr. Leonard Yeo. Disclosures: Nil. There are no profits obtained from this app development. Some of the contents in the application has been referenced from NHG "All you need to know about Stroke". The contents included have been vetted by Dr. Leonard Yeo, Consultant Neurologist, NUHS and the Chinese translation have been done by Dr. John Ying. 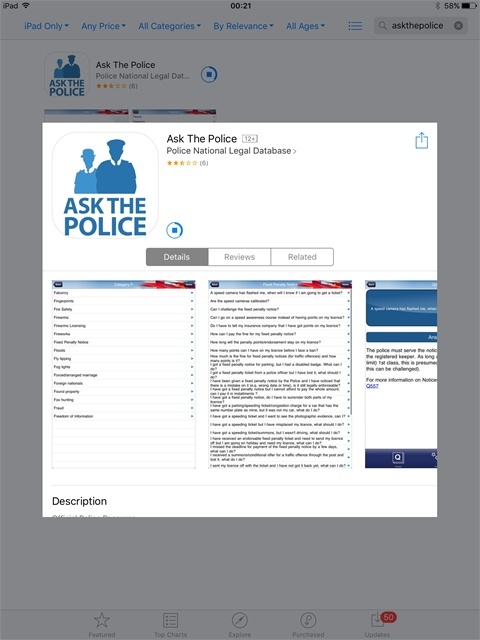 This app ( available free from the App Store) covers the frequently asked questions that police receive. It covers all forces and has an index as well as an option to ask a question. Really good. Everything Arthritis Research UK do is driven by knowledge to positively impact on what matters to people with arthritis. Our long-term commitment is to: prevent the onset of arthritis develop a cure for arthritis transform the lives of those with arthritis. • Our popular telephone book and discussion group, TalkTime, allows older people to enjoy a stimulating discussion with others from the comfort of their own home. The Patients Association’s motto is ‘Listening to Patients, Speaking up for Change’. This motto is the basis on which we build all our campaigns. From the contacts we receive via our Helpline, we capture thousands of accounts each year from patients, carers, family members and friends about peoples experiences of the health and social care service. 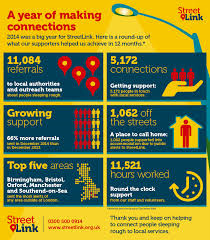 We use this knowledge to campaign for real improvements across the UK. In addition, our Helpline provides valuable signposting and information for patients and supports them as they navigate through the healthcare services. Family Lives offers a confidential and free* helpline service (previously known as Parentline). Please call us on 0808 800 2222 for information, advice, guidance and support on any aspect of parenting and family life, including bullying. Family Lives free helpline support staff take calls from 7am – midnight, any calls during the night are answered by Samaritans. If you need to speak to someone during the night we can divert your call to the Samaritans who are available to offer emotional support. We currently answer 76% of all callers ringing with over 63% answered first time. If you don’t get answered first time please do try again. Homelessness is a complex issue-there is no single cause and no single solution. Medical Alert jewellery helps many people live their life with reduced worry. Some medical conditions mean that you need very specific information to be conveyed to the Medical team in order to receive the best treatment. Your individual electronic emergency record together with your jewellery means that emergency responders know how to help you and how to contact our emergency team for your details and are made aware of any allergies or medical problems that could become life threatening. The office opening hours are 9.30 – 4.30 Monday to Thursday and 9.30 – 1.30 on Friday. MedicAlert can be contacted during office hours, Monday to Friday 9am to 6pm and Saturday 9am-3pm. Due to limited office space we can only see visitors by appointment. Call us on 01908 951045 within the UK or +44 (0)1908 951045 from outside the UK. Keep updated on the discoveries I make by checking out my blog. First Stop is a great resource for older people and their families worried about housing issues. Advice and support for older age.We provide information and a national advice service for older people, their families and carers. • a means of empowering those who may be suffering abuse and neglect, if appropriate to transfer them to specialist services to protect them from harm. Giving older people the opportunity to live fulfilled and respected lives. The Housing Options and Advice team initially assesses all customers who present themselves as homeless and provides advice and intervention to prevent people losing their homes. The service provides free, confidential advice on a range of housing matters if you are homeless or likely to become homeless. This website provides information, support to those affected by abuse of any kind. Lists UK helplines. There is a webcam portal for BSL users via the Royal Association for Deaf people. A website that covers a variety of information and advice on health, legal, international, children and financial issues. Tel: 0800 616101(free, 8am–8pm Mon–Fri, 10am–4pm Sat.) Helpline for children/young people. Help and support on issues big and small to anyone caring for children, to ensure that life is better for all. Covers a vast array of issues from bedwetting to runaways, prisonners to pregnancy. Information about adverse psychiatric side effects of everyday medicines. Information on health and diseases. Promotes and campaigns for independent user led advocacy for all mental health service uers and meaningful involvement of users in all aspects of mental health service planning and delivery. Lists local services. For people suffering with aphasia post stroke. Useful information concerning all forms of mental health concerns including medication can be found on the websites of Mind and The Royal College of Psychiatrists. 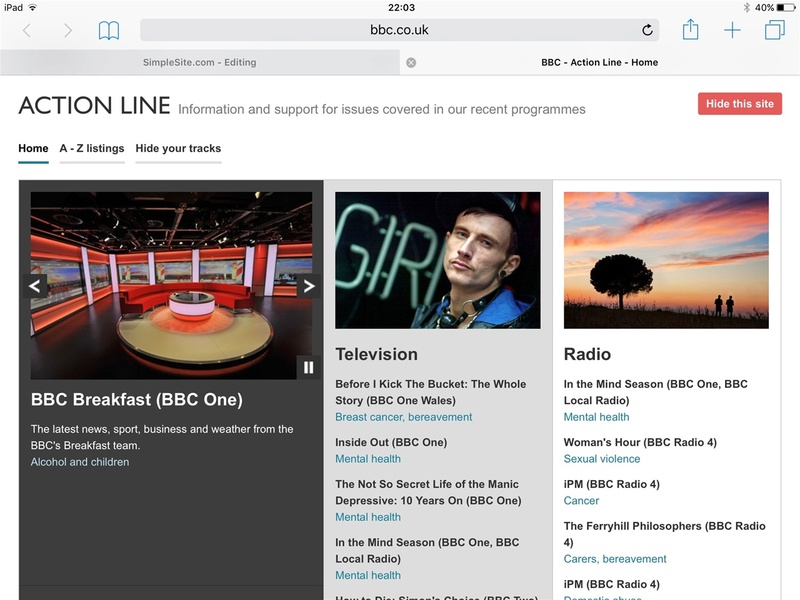 Readable, user friendly and evidence based information about mental health problems. Description of service Improves the lives of people affected by cancer. Provides practical, medical, emotional and financial support and push for better cancer care. As well as providing help and social care professionals (Macmillan Nurses) the support provided includes Macmillan Support Line, and vital information services in hospitals, libraries and the community. Also provide benefits advice services, Macmillan Grants, and support to carers. Offers Learn Zone, a range of free learning and development opportunities for people affected by cancer, some of which may also be of relevance to health and social care professionals. Macmillan supports a huge network of self-help and support groups. There is access to a translator for anyone calling the main helpline for people needing help in other languages and additional support for the hard of hearing. Some written information available in other languages as well as braille and large print. Your local CAB can provide information and advice in confidence or point you in the right direction. To find your nearest CAB, have a look at the website above. CAB offers free, confidential, impartial and independent advice from over 3,500 locations. These include high streets, community centres, doctors’ surgeries, courts and prisons. Can help people resolve their problems with debt, benefits, employment, housing, discrimination, and many more issues. Advice may be given face-to-face or by telephone. Most bureaux can arrange home visits and some also provide email advice. Website facility to search for local bureaux. The Pension Service helps with State Pension eligibility, claims and payments. They can also put you in touch with your local pension centre. This is a particularly useful site with lots of really useful information about everything from financial assistance to helpful tips and advice on daily living. For any enquiries, advice or support please use our online enquiry form to get in touch. We offer information and support on a number of subjects including travel and transport, oxygen, equipment, welfare benefits, as well as many issues relating to over 40 lung conditions. For general enquiries or to contact our head office team, please get touch. This page is dedicated to CMB. A brilliant person. A brilliant allocator. A brilliant friend.